Germination is the process by which a plant grows from a seed. The most common example of germination is the sprouting of a seedling from a seed of an angiosperm or gymnosperm. Plant growth is said to be localized. In this case, growth is restricted to certain fixed regions like root tips and shoot tips. After the seed germinates, the embryo starts to grow as indicated in the figure below. 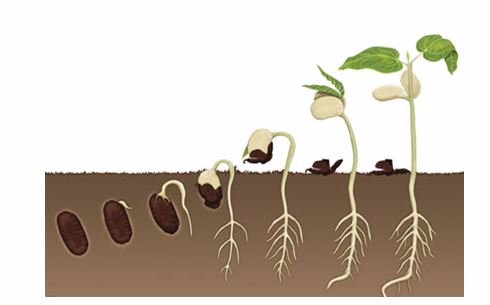 The figure shows growth of a bean seedling between day 2 and 11. As the radicle elongates, the plumule is curved. At this stage, young plant is called a seedling. Accompanying these morphological changes are chemical changes which occur inside the seed. As the seed absorbs water the foods are hydrolyzed into soluble food. The starch stored in the cotyledons or endosperm is converted to sugar by action of diastase. In some seeds, lipase catalyzes the hydrolysis of fats to fatty acid and glycerol. It is likely that glycerol is converted into sugars since it is not detected in germinating seeds. The proteolyctic enzymes catalyze the hydrolysis of proteins to amino acids. During germination a lot of energy is required. This energy is derived from the stored food materials.It follows, therefore that as the seed germinates its weight decreases. This is because the stored food is being used. The decrease in weight continues until the seedling is capable of photosynthesizing. A seed is a structure formed after the fertilization of an ovule. A seed contains the embryo of the plant. The embryo grows and develops into a mature plant which produces more seeds. The embryo is made up of the plumule, radicle and cotyledons. The plumule develops into a shoot. The radicle develops into a root. 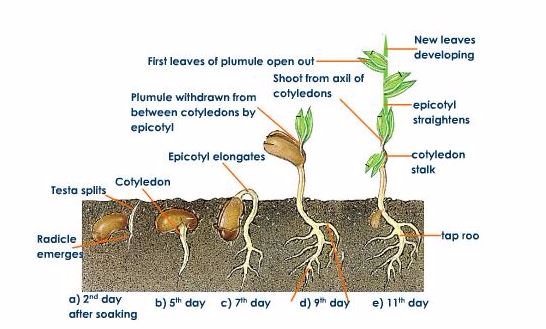 The cotyledons have nutrients which are utilized by the seed during germination. Seeds sometimes have additional nutrient tissues in form of the endosperm. The seed coat, also called testa, encloses the fertilized ovule. The testa has a pore called the micropyle. The micropyle allows water and air to get in and out of the seed. On the testa is a scar called the hilum. The hilum marks the point of attachment to the funicle. The funicle attaches the seed to the placenta on the ovary wall.The plumule has small leaves. The leaves are the replica of natural leaves. A radicle is a replica of a mature root. The testa is hard and encloses the seed, hence protecting it. 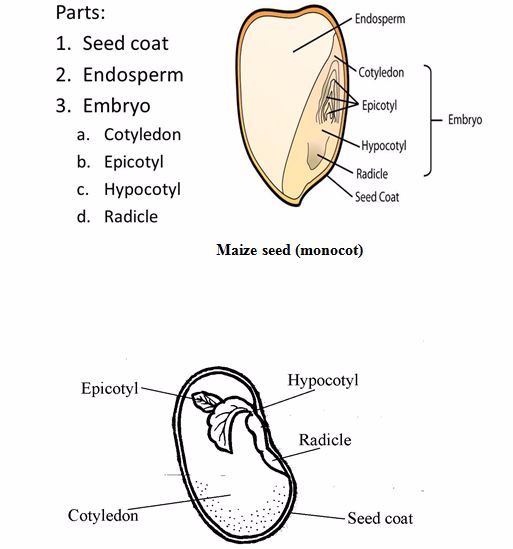 The figures below show the parts of a monocotyledonous seed (maize) and a dicotyledonous seed (bean). Seeds require certain conditions for them to germinate. These conditions are water, oxygen, optimum temperature and light. Water is a solvent required for enzymatic activities. Water enters the seed through the micropyle. The water softens the testa thus allowing the seed to take in water. The osmotic pressure in the seed causes water to enter the seed by osmosis. Pressure is created in the swollen seed, rupturing the softened testa. Activation of enzymes: When seeds are formed, most plants store a food reserve with the seed, such as starch, proteins, or oils. This food reserve provides nourishment to the growing embryo. When the seed imbibes water, hydrolytic enzymes are activated and break down these stored food resources into metabolically useful chemicals. Most seeds need enough water to moisten them. The uptake leads to the swelling and the breaking of the seed coat, which enables the embryo to emerge from the cotyledon(s). Water is used to dissolve food substances. The food needs to dissolve so as to diffuse or get transported to the growth parts of the embryo in the seed. Water is needed for the development of the cell sap vacuoles. Large cell sap vacuoles contribute to the increase in the size of cells, hence, growth. Oxygen is required by the germinating seed for metabolism. It is used in aerobic respiration, the main source of the seedling's energy until it grows leaves. Respiration produces energy for processes like cell division and transport of food to growing regions. Oxygen diffuses into the seed through the micropyle. The softened testa later allows oxygen to diffuse directly into the tissues. Temperature affects cellular metabolic and growth rates. Seeds from different species and even seeds from the same plant germinate over a wide range of temperatures. Seeds often have a temperature range within which they will germinate, and they will not do so above or below this range. Many seeds germinate at temperatures slightly above 16-24 °C. Temperature is an important requirement for activation of enzymes. The enzymes in the seed work best at optimum temperature since they are denatured by high temperatures and inhibited by extremely low temperatures. Some seeds may require to be first exposed to low temperatures before they can germinate. This is usually the case in plants that grow in temperate climates. The seeds need to go through winter before the onset of spring when the seeds germinate. The requirement of light for germination varies from plant to plant. Some plants need darkness while others need light in varying degrees. There are two types of seed germination namely, hypogeal germination and epigeal germination. Epigeal germination is a type of germination in which the cotyledons are brought above the soil level. This type of germination is seen in many dicotyledonous plants, such as beans, sunflower, castor, bean, etc. Some monocotyledonous plants such as the onion also show epigeal germination. In a dicotyledonous seed, the plumule and radicle are attached to the two cotyledons. The hypocotyl elongates rapidly raising the cotyledons into the air. The hypocotyl is the region of the stem beneath the cotyledons and directly above the young root of a seedling. The epicotyl is the region of the shoot of a seedling which is found above the cotyledon of an embryo. The seed absorbs water and softens the testa. The cotyledons swell and rupture the testa. The radicle elongates and emerges through the seed coat. Roots develop from the radicle. The hypocoty elongates rapidly and develops a curvature. The curved part emerges above the soil. The hypocotyl eventually straightens, raising the cotyledons and the plumule above the soil. The cotyledons are also referred to as seed leaves. The cotyledons enlarge and turn green to carry out photosynthesis. The epicotyl elongates thus increasing the height of the seedling. The first foliage leaves emerge. The cotyledons shrivel as the stored food materials are used up. The first foliage leaves enlarge and start carrying out photosynthesis. Hypogeal germination is a type of germination in which the cotyledons remain underground. It occurs in plants such as maize, pigeon peas, wheat, etc. The part of the embryo that elongates is the epicotyl. The epicotyl elongates rapidly, raising the plumule above the soil. The cotyledons remain below the ground level. The shoot is pushed through the soil particles. In maize, the plumule sheath, known as the coleoptile, protects the plumule. The coleotile grows towards light. The foliage leaves emerge through the split end of the coleoptile. The foliage leaves carry out photosynthesis. The radicle is protected as it emerges through the maize grain by a sheath called coleorhizae. The growth of the radicle and the plumule causes the elongation of a seedling. A radicle develops and forms the roots, while a plumule develops and forms the shoot. The rate of growth can be measured at the tip of the root or shoot. Cells at the root and shoot apices have a high capacity to divide. The dividing cells are called meristematic cells. The cells make up a tissue called the apical meristem. These cells rapidly undergo mitosis, thus enlarging and giving rise to more cells. The very cells increase the size of the shoots and roots. The cells differentiate to form tissues that carry out specific functions. The plant organs elongate, resulting in growth at the root and shoot apices. This type of growth is known as primary growth. The meristematic tissue at the shoot apex actively divides, leading to the elongation of the shoot. The meristematic tissue also gives rise to leaves. Leaf primordia, from which the leaves develop, occur at the nodes of the shoots. The part of a stem between one node and the next is called the internode. The axillary bud has meristematic tissue known as the intercalary meristem. The meristem tissue brings about internode elongation.